At the beginning of the street promotion, most of people showed the weird eyes on their faces and then stayed away from volunteers by rejecting the promotion leaflets. In a long run, these kinds of encounters will surely make volunteers very frustrated. To boost morale, the selling skills of street vendors at night market became the best target for volunteers to imitate and learn. As time went by, people were gradually aware of the underlying meaning of “Worship Tâi-uân-sîn”. And, more people were willing to show their respect towards Tâi-uân-sîn. In a crowd scenario, a phenomenon of overheating censer causing burning incense on fire spontaneously from bottom to top, or commonly called “Huat-lôo (Taiwanese pronunciation)”, has been encountered while too many people paying their respects within a short period of time. Interestingly, in an opposite scenario a phenomenon of burning incense on fire spontaneously from top to bottom, or called “Hué-sio-lôo (Taiwanese pronunciation)”, has been encountered while only a few burning incense sticks in the censer. These phenomena are shown in Picture 14 and Picture 15. 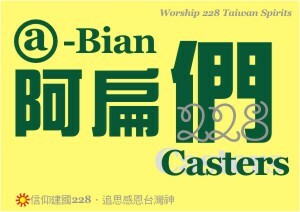 In a special encounter, an elderly man with a mainlander’s accent shouted loudly at the site expressing his discontent with the “Worship Tâi-uân-sîn” movement, and at the same time argued that victims' families of 228 Incident had been compensated by government why this subject was brought out to stir up the complex relationship between native Taiwanese and mainlander. 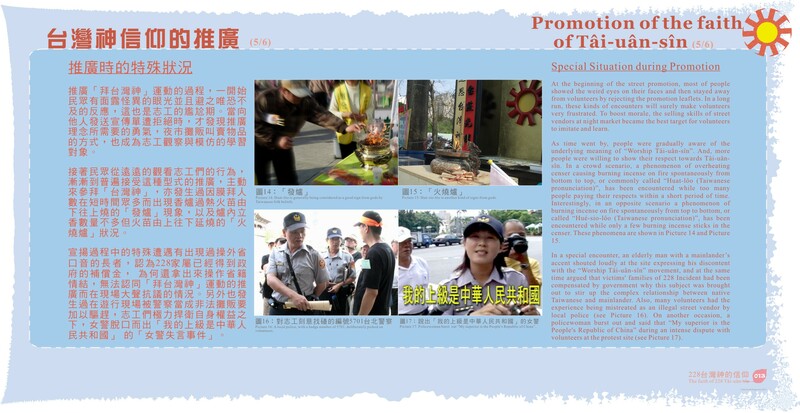 Also, many volunteers had the experience being mistreated as an illegal street vendor by local police (see Picture 16). On another occasion, a policewoman burst out and said that “My superior is the People's Republic of China” during an intense dispute with volunteers at the protest site (see Picture 17).